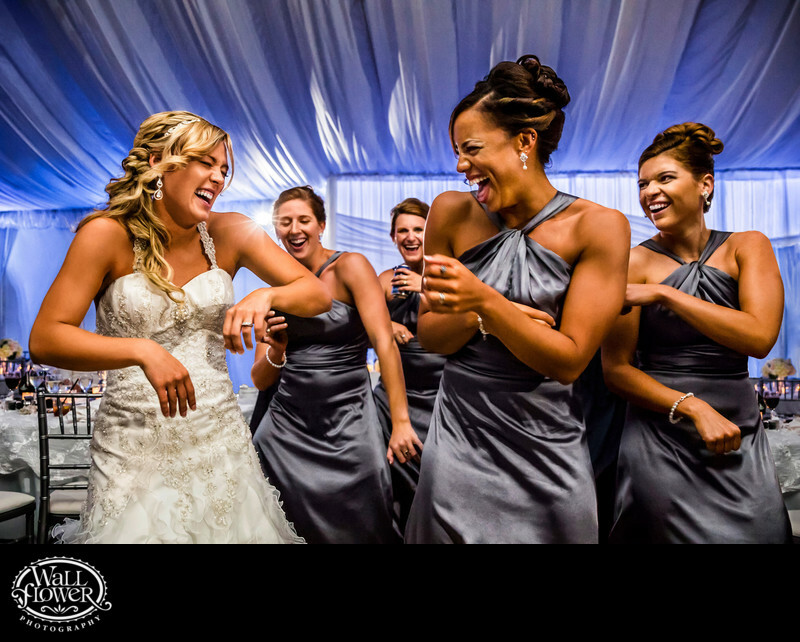 This bride and several of her bridesmaids were dancers and cheerleaders, and broke out all sorts of dance moves as the party got rolling late in her wedding reception. The location is the tented pavilion at the Chambers Bay Golf Course in University Place, Washington. It's the home of the 2015 U.S. Open golf tournament, although that was still a year away when this wedding took place. The tent is white, but purple-blue uplights provided by the DJ, Tony Schwartz, added a lot of color and visual interest to the photo. Three radio-controlled Speedlites on stands, one just barely visible over the bride's shoulder, provided much of the lighting on the women and helped to freeze the fast-moving action. You'll find plenty more photos from Chambers Bay weddings on this website, particularly in this gallery (Candid) plus the Created and Places galleries.